Thousands of republicans gathered at scores of events across Ireland last weekend to mark the 97th anniversary of the 1916 Easter Rising. For the first time, there were two separate Easter commemorations in County Tyrone. Organisers have said up to 1,500 people attended the independent Tyrone National Graves Association commemoration in Carrickmore on Monday, while Sinn Fein members took part in a separate event the previous day. One of the main events of the day took place in Belfast where members of the new republican party Eirigi held a parade along the Falls Road to Milltown cemetery. 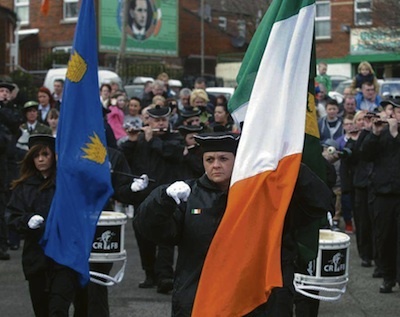 Upwards of 800 people participated in the commemoration parade and ceremonies to remember all those who gave their lives in the cause of Irish freedom. Assembling on the Falls Road near its junction with Whiterock Road, the parade made its way to Milltown Cemetery. Prior to the commencement of the parade itself, a short wreath-laying ceremony was held at the former home of James Connolly. The parade was led by a single piper and was also accompanied by three bands. The proceedings at the republican plot were chaired by Maire Drumm, while the address was given by Wexford councillor John Dwyer. During his address Mr Dwyer spoke about the influence of Irish Citizen Army founder James Connolly. “The Easter Rising was the result of a coming together of like-minded people from nationalist, republican and socialist backgrounds agreeing as they did that the British had no right and could never have a right to occupy or interfere in the affairs of Ireland,” he said. The Eirigi councillor also accused the British establishment of selective internment of political opponents, including Marian Price and Eirigi member Stephen Murney. “The arrest without trial of opponents of the current administration is proof of how they fear the determination of republicans to pursue our agenda,” Mr Dwyer said. He said the ideals of those who took part in the 1916 Rising have been “betrayed”. “The betrayal of the ideas of the men and women of 1916 and of the resistance since has been repeated over and over and over by many who proclaim themselves republicans and socialists -- but we don’t need to waste our time here in condemnation of those people,” Mr Dwyer said. There were also a number of other events across Belfast including Sinn Fein’s annual gathering at New Lodge. Speaking at his party’s main commemoration in Dublin on Easter Sunday, Sinn Fein’s Martin McGuinness revealed that his meeting with British Prime Minister David Cameron was “one of the least satisfactory” engagements he had held with a British Prime Minister in the course of the Peace Process. But he remained optimistic about the future. “The Good Friday Agreement provides for a Poll on Irish unity. Such a Poll provides an opportunity for debate on the future of Ireland,” he said. “The political geography of the North is changing. Recent census figures show that. Politics across Ireland is in flux. A new Ireland can be what we make it. “A Border poll is part of the process of building a modern and dynamic New Republic on this island - an agreed Ireland achieved by peaceful and democratic means. “It’s time to let the people have their say. The need for republicans to “reach out” to unionists was raised frequently by Sinn Fein speakers at Easter events, particularly by party chairperson Declan Kearney at a commemoration in Monaghan. He also spoke to republican hardliners when he said that “militarism contributes nothing” to the achievement of republican objectives. But he suggested there was scope for talks. However, Sinn Fein’s policing spokesperson Gerry Kelly adopted a far more confrontational stance when he said that the reputation of Irish republicanism had been “sullied” by the breakaway groups who had “blurred the definition of revolutionary and criminal activity”. He added: “There is only one IRA”. At its Easter commemoration in the City Cemetery in Derry on Sunday, Republican Sinn Fein vice president Des Dalton said his party was not interested in Sinn Fein’s offer of talks. “Our message here for Declan Kearney and the other puppets of the machine is that we, as Irish Republicans, have no desire and see no purpose in sitting and talking to those who are now an integral part of British rule in Ireland,” he commented. He also dismissed recent calls for a border poll as a publicity stunt. Dungiven republican Mickey McGonigle, who chaired the commemoration, also criticised Deputy First Minister Martin McGuinness. “He was not an Irish republican when he accepted the handshake from the Queen of England. “I hope all areas will give them their answer the way the voters did in Mid Ulster where 10,000 less than before voted for them,” he said, referring to the recent Westminster by-election in the constituency. Republican Network for Unity (RNU) also questioned Sinn Fein’s apparent talks offer. In a statement, they said that the comments made by Gerry Kelly over the Easter period had overtly attempted to criminalise and demean alternative republican activists from across the spectrum. They pointed out that the various criticisms, smears and allegations levelled at the dissidents had previously been directed at Sinn Fein and the Provisional IRA. In north Belfast, the RNU and the Henry-Joy McCracken Republican Flute Band held a sizable commemorative parade and wreath-laying ceremony for four Ardoyne members of Na Fianna Eireann [the youth wing of the IRA] who all died during 1972. A member of Oglaigh na hEireann fired shots over the local memorial in a salute to the four youths, aged between 15 and 17 -- Davy McAuley, Josh Campbell, Josie McComiskey and Bernard Fox -- who died in separate tragic incidents while on active service. The National Vice-Chairperson of RNU, Pol Crawford delivered the main oration. He described the four youths as republican martyrs, who had responded as members of the broader nationalist community to a unionist pogrom and the subsequent British military intervention. “Many young nationalist became republicans in the highly politicised atmosphere of these times,” he said. Meanwhile in Derry, a brother of murdered ‘Real IRA’ leader, Alan Ryan addressed the main 32 County Sovereignty Movement Easter commemoration. Several hundred people attended the event which was led by an eight-strong colour party to the republican plot at Derry City Cemetery. In a departure from previous years, the commemoration at Derry City Cemetery was not given an IRA statement. Young people threw stones at the PSNI as the commemoration moved through Creggan and a petrol bomb was thrown at an armoured vehicle which took up position directly outside the cemetery during the commemoration. No-one was injured and the PSNI made no arrests. The main oration was given by former Omagh councillor, Francie Mackey. He commented on an alleged dissident republican threat to Sinn Fein’s Martin McGuinness. “A couple of weeks ago Martin McGuinness alleged he received a death threat from republicans and that message was delivered to him by British police representatives, the PSNI,” he said. “Messages between Stormont ministers and their British regional police force holds no importance or merit for republicans.